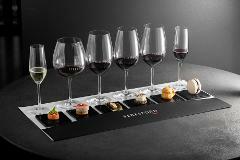 Discover the Beresford Classic Range paired with a local tasting plate of regional flavours. Wines include: Angelique Premium Cuvee, Chardonnay, Grenache Rose, GSM, Cabernet Sauvignon and Shiraz. Discover the Beresford Classic Range: Angelique Premium Cuvee, Chardonnay, Grenache Rose, GSM, Cabernet Sauvignon and Shiraz. $10 redeemable on bottle purchase. 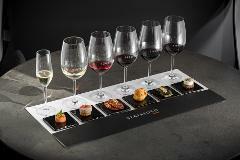 A flight of six wines heroing our Estate & Limited Release red wines paired with a tasting plate of regional flavours. Wines include: Angelique Premium Cuvee, Estate Grenache, Cabernet Sauvignon and Shiraz. A flight of six wines heroing our Estate & Limited Release red wines: Angelique Premium Cuvee, Estate Grenache, Estate Cabernet Sauvignon, Estate Shiraz, Limited Release Shiraz and Sparkling Shiraz. $10 redeemable on bottle purchase. 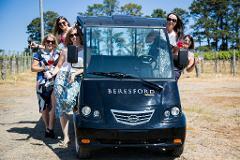 Indulge in the complete Beresford Estate discovery experience. Including vineyard tour and Icon Tasting Experience.